Neste post eu explico como alterar o FQDN no contector SMTP, para corresponder ao MX Record e assim minimizar problema com blacklists de spam. Porém, se tivermos vários conectores, não é fácil perceber qual usamos para receber e-mails do exterior. "When the AuthMechanism parameter on a Receive connector is set to the value ExchangeServer, you must set the FQDN parameter on the Receive connector to one of the following values: the FQDN of the transport server "SERVER.domain.local", the NetBios name of the trasnport server "SERVER", or $null." 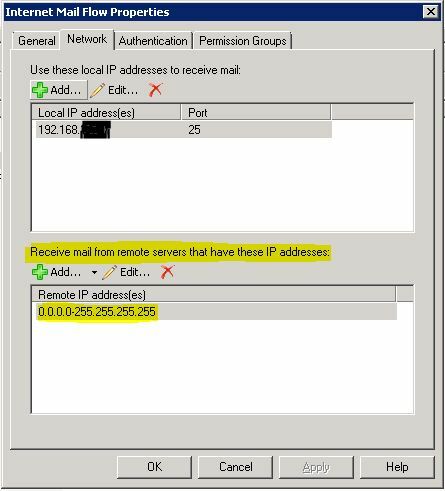 "Don’t modify the FQDN value on the default Receive connector named “Default <Server Name>” that is automatically created on Hub Transport servers. 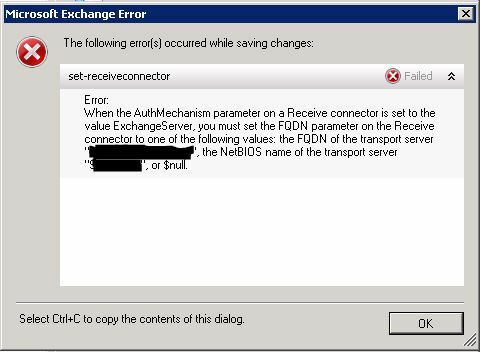 If you have multiple Hub Transport servers in your Exchange organization and you change the FQDN value on the “Default <Server Name>” Receive connector, internal mail flow between Hub Transport servers will fail." - Escolher o modo "Internet"
- Next até ao fim. A Microsoft tem uma ferramenta muito útil para testar a conectividade do Exchange. Esta ferramente é útil, quando queremos despistar problemas com dispositivos móveis ou remotos. Verifica-se esta situação quando se faz um telnet para o MX record e o servidor responde com outro nome. 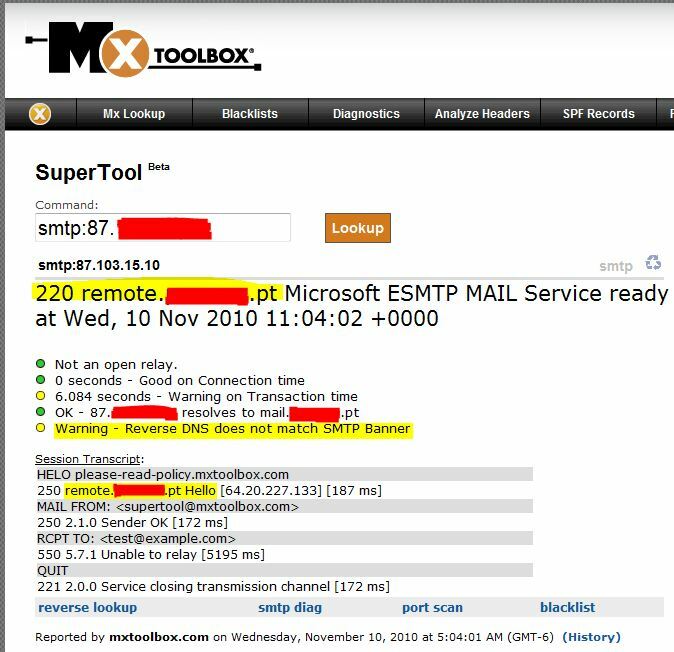 Também se pode verificar esta situação fazendo um teste com sites do género do www.mxtoolbox.com, e geralmende é identificado com a mensagem "Reverse DNS does not match SMTP Banner". Neste post, explico como identificar o conector que recebe os e-mails do exterior, e também o erro que por vezes acontece quando se tenta alterar o FQDN. O Exchange 2003 não tinha uma forma de criar excepções no IMF. 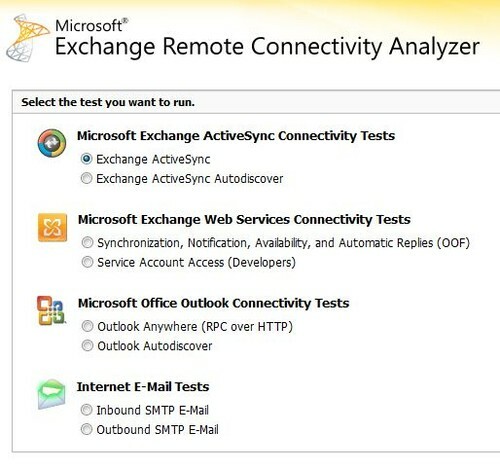 O Exchange 2007 e 2010, já permitem configurar este tipo de regras. Para esta configuração é necessário usar o Exchange Management Shell. 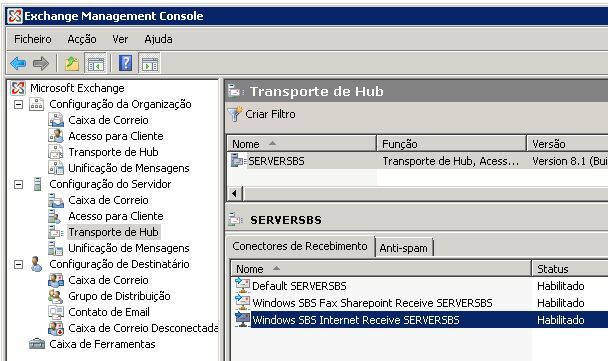 Get-ContentFilterConfig e analisar os campos BypassedSenders e BypassedSenderDomains. SMTP headers can be spoofed easily. If spammers spoof any of the addresses or domains you whitelist, your recipients may end up getting more spam as all of it will bypass the Content Filter. Use SenderID Filtering to detect and protect your mail system from header spoofing. Maintaining whitelists, just as maintaining blacklists, is a manual process that imposes its own management costs. Checking every inbound message against a list of whitelisted recipients imposes a performance penalty - miniscule as it may be. Use the whitelists sparingly. Nevertheless, many IMF users have repeatedly demanded this functionality and it's great to finally have it in what some folks call IMF v3.0.